This entry was posted in America America Immigration and tagged F-1 visa F-1 visa USA usa visa Visa on April 21, 2015 by Blog Author. 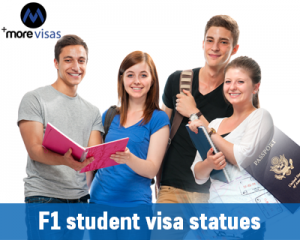 All F1 students in the United States have to ensure that, they maintain student visa status. In their respective school, they should enroll themselves as full-time students. The students should also check with their campus about credit hours required each semester. Graduate students should ensure to maintain the minimum required number of credit hours so that they can be considered as full time. If a student is unable to enroll themselves in required number of courses on full-time basis due to some valid reason, they need to take approval of the department advisor’s approval and also need to inform their designated school officials that they can still maintain their full-time status with USCIS. All students should maintain good academic records throughout their course. Even failing to maintain good academic standing for more than two consecutive semesters would lead to disqualification of their F1 visa status. Students on F-1 visa USA must also try complete their studies by the expiration date mentioned on the I-20 form. If you anticipate that you would not be able to complete your studies in the given period. Then you should apply to school’s Foreign Student Advisor seeking an extension of at least thirty days prior to the expiration. They usually offer an extension for academic or medical reason as long as there is no violation of visa status. If you plan to transfer from one school to another on arrival, on F-1 visa USA, then you are required to notify the current school of your intention to transfer and obtain the I-20 form from the school which you wish to join. You would require to complete the student certification section of the I-20 and must deliver them to the foreign student advisor at the new school where you wish to join within fifteen days of beginning attendance at the new school. If you intend to change majors at your current school, then you need not notify USCIS. However, you would need to get a new I-20 and submit it to the foreign student advisor within 15 days of beginning the new program. You should also ensure not to work off campus without the employment authorization. To apply this visa, contact MoreVisas by filling Enquiry Form. ← How to Get More Points in Austria Point Calculator?